All mosaic pictures in galleries were created with our image mosaic program Mazaika. 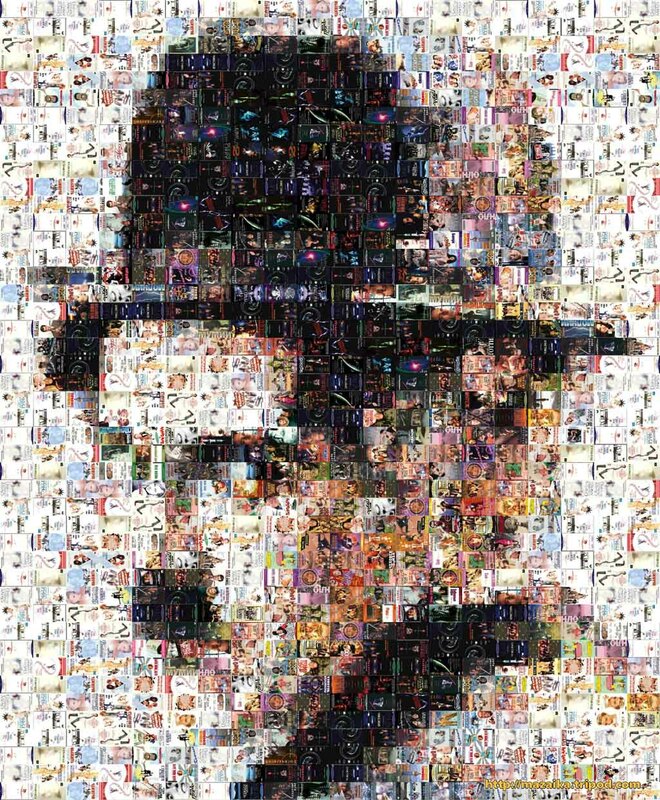 If you have a digital camera or photo collection you can make your own professional looking image mosaic. Just download a free trial version of Mazaika and use it. Also, if you don't have enough your own image files, you can download some tile libraries to use with Mazaika. 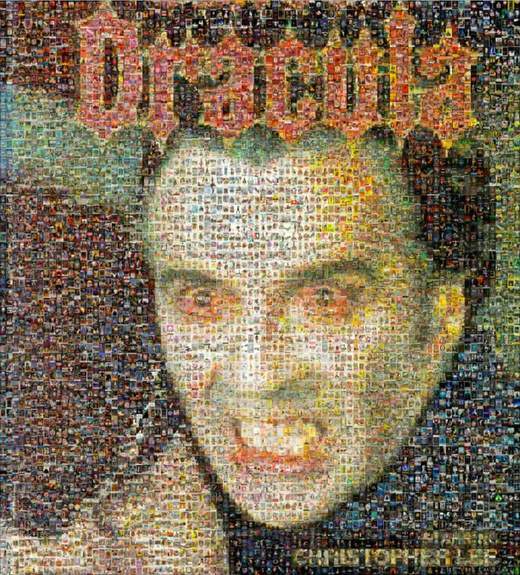 Scars of Dracula: online interactive photo mosaic composed from 5000 sci-fi fantasy and horror movie posters. This online photo mosaic has a search function. 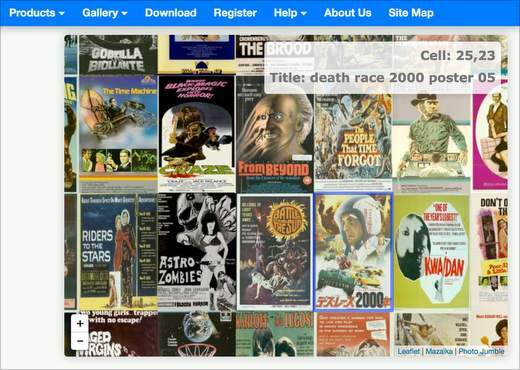 Enter a part of film title in the search text field and you get a list of movie titles with their posters positions in the photo mosaic. Click on the name and the mosaic image will be positioned to show the movie picture poster. 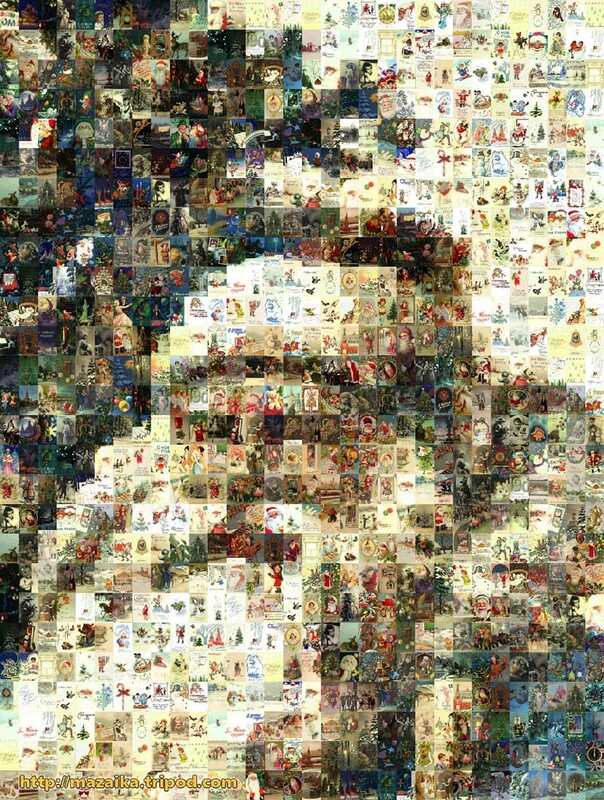 This example is an illustration of photo mosaic usage for interactive social media projects. See online interactive photo mosaic. Queen Elizabeth's giant mosaic displayed on Buckingham Palace. Mazaika.com was commissioned to create mosaics for Face Britain project running by The Prince's Foundation for Children and the Arts in honor of the Queen's Diamond Jubilee. 32 animated mosaic portraits of HM The Queen were made using more than 200,000 British kids self-portraits as mosaic tiles. 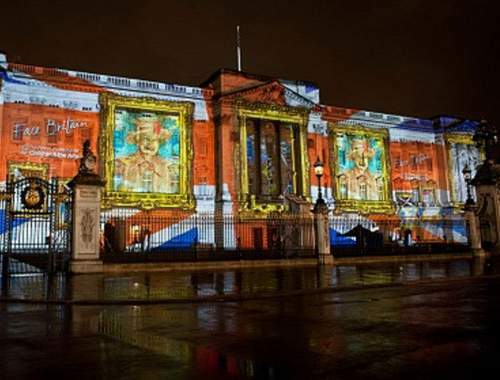 They were projected onto Buckingham Palace on April 19th – 21st 2012. For more details please see Face Britain here. World's biggest photo mosaic. 33 Gigapixel photo mosaic image. 157,500 pixels width, 210,000 pixels height. 201,948 unique children self-portraits submitted for Face Britain project were assembled into 450 rows and 450 columns photo mosaic. See interactive zoom and pan mosaic. More about Face Britain project. This is the famous stained glass Dove of Peace in St. Peter's Basilica. Huge 37,800 x 36,450 pixels mosaic example. File size in BMP format is 3.84 GB (i.e. 4,037 MB) There are 70 columns and 90 rows in the mosaic. Single tile size is 540 x 405 pixels. For more details see Zoom and Pan mosaic. This is a poster fragment of old movie Barbarella (1968 with Jane Fonda). It was made from the collection of comic book covers. Please note that there are not so many tiles in this picture - less than 600 - but due to the small details on the comic covers that were regarded in the mosaic calculation - the whole picture is very detailed. In 2009, this mosaic has been featured in a theatrical motion picture entitled Funny People directed by Judd Apatow with Adam Sandler, Seth Rogen and Leslie Mann in the lead roles. 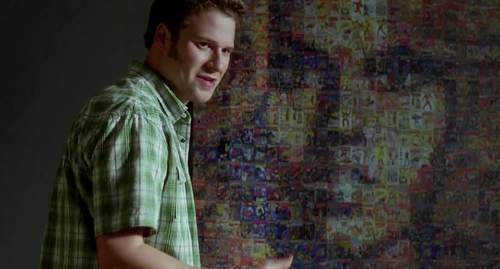 The mosaic poster of Barbarella was used as set dressing in scenes that take place inside Ira's (Rogen) apartment. This high detailed photo mosaic of Chairman Mao was compiled from original flower photos and named after his famous slogan: Let a thousand flowers bloom! See Zoom and Pan mosaic. 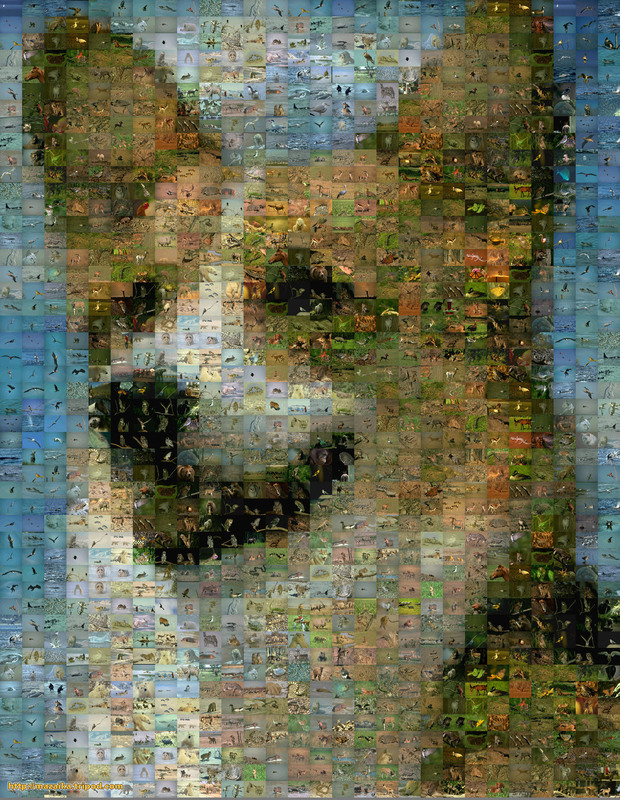 This is a large detailed mosaic: 21,081 x 30,000 pixels, with 400 x 400 pixels every tile. It was created with Mazaika for Mac. 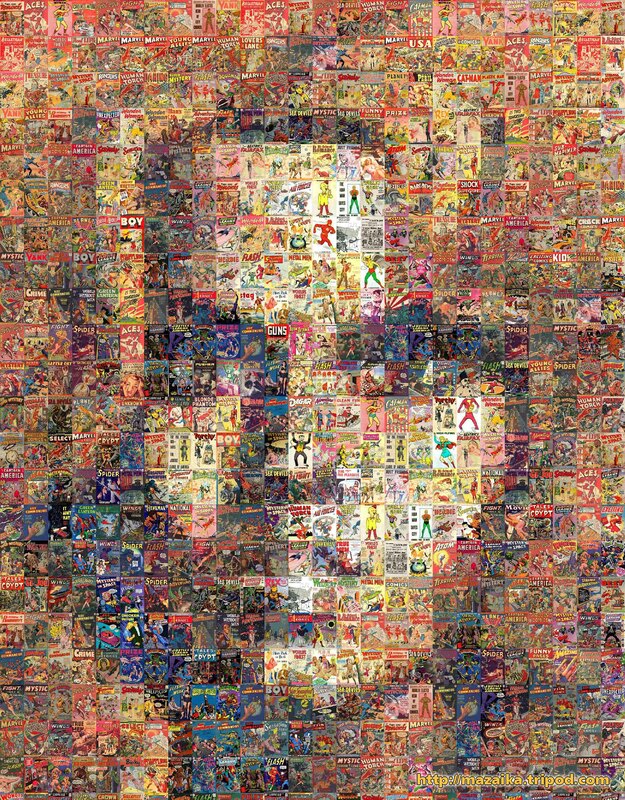 High detailed photo mosaic of iconic Girl with Hair Ribbon by Roy Lichtenstein. The mosaic contains thousands of classic paintings fragments. This detailed Zoom and Pan photo mosaic don't need Flash. It uses HTML5 technology and can be viewed in any modern browser on Windows and Macintosh and on iPads, iPhones and other mobile devices! Santa made of Xmas and New Year postcards. See Zoom and Pan mosaic. Cover of DVD The Shining (1980) Stanley Kubrick's movie. 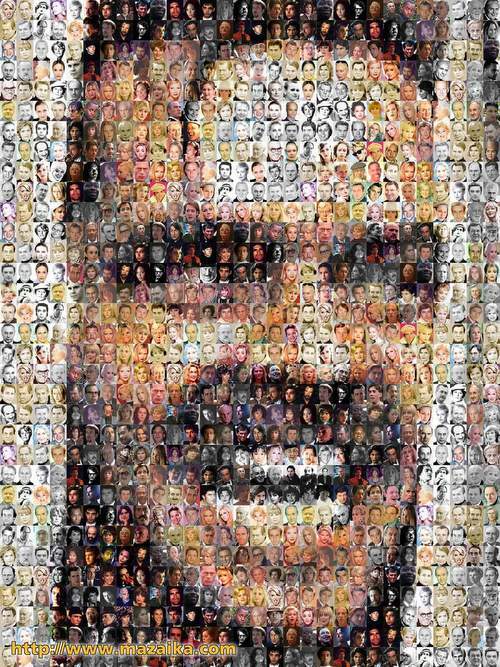 The face of Jack Nicholson as John 'Jack' Daniel Torrance made from a library of about 3000 faces of actors from around the world. Mosaic is 30 tiles width and 33 tiles hight. 990 tiles at all. Note that all tiles used as-is (with no special color adjustment). Mazaika just matches the smaller images to the big picture. This is a fragment of an old telegraph blank. (Do you remember what telegraph messages are?) This one was issued in 1958 with a nice picture of Russian Santa - Ded Moroz by Soviet artist E. Gundobin. 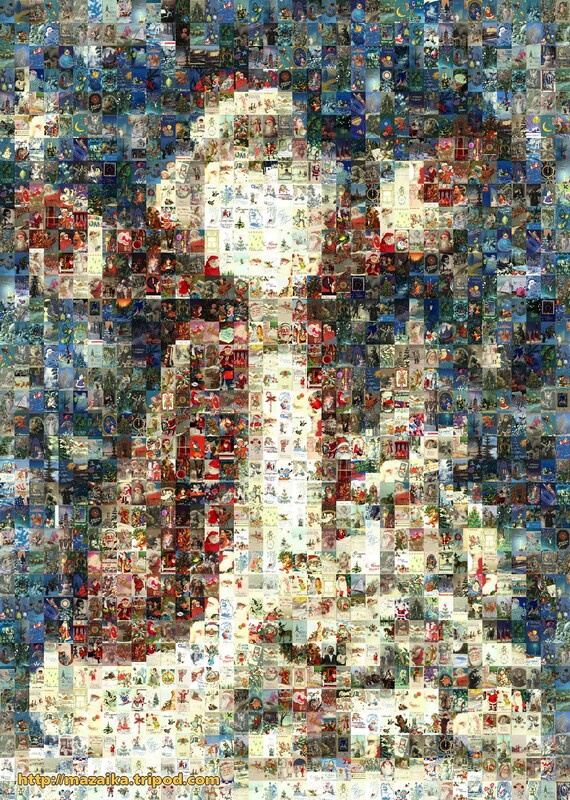 Mosaic made from Christmas and New Year postcards. More than 500 of these cards you may see at the postcard section of our site. Also, you can use a free Santa picture library to create your own mosaics using the Mazaika program. This picture made of Xmas and New Year postcards. More than 500 of these cards you may see at the postcard section of our site. Also, you can use a free Santa picture library to create your own mosaics using the Mazaika program. Fragment of the poster of the very old movie The Kid (1921) by Charles Spencer Chaplin. It was made from the collection of about 900 different video cassette covers. This is a small collection - to make more tile variants we have arranged cassette boxes horizontally and have rotated whole collection images clockwise and counterclockwise to double collection up to 1800 images at all. In November 2007 Ticino7 - a Switzerland TV program review (100'000 readers) has devoted its weekly issue to Charlie Chaplin, poeta dei tempi moderni [poet of the modern times], 30 years after his death. 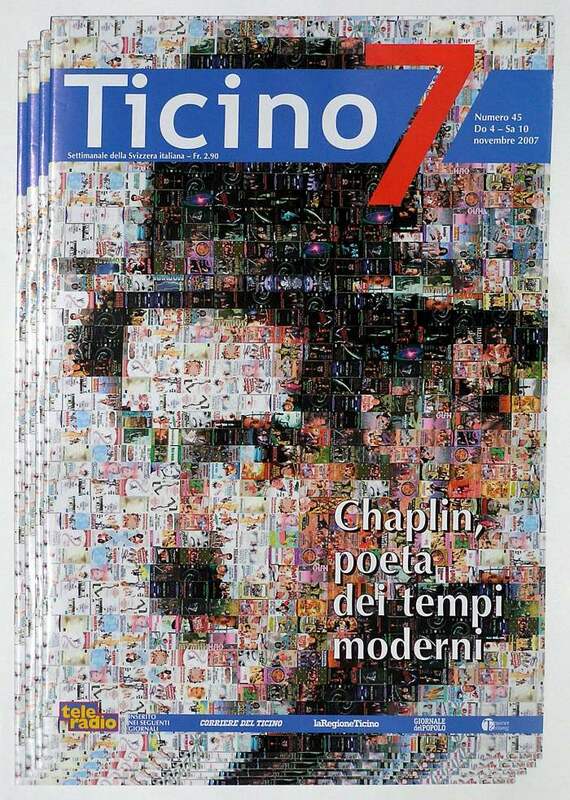 They have used the mosaic for that magazine cover. Johann Gutenberg the inventor of printing. This mosaic was made from a collection of Russian magazine and tabloid covers. You may download this library here. See Johann Gutenberg Zoom and Pan mosaic. This photo of kitten 25x32 cells made from different animal photos. 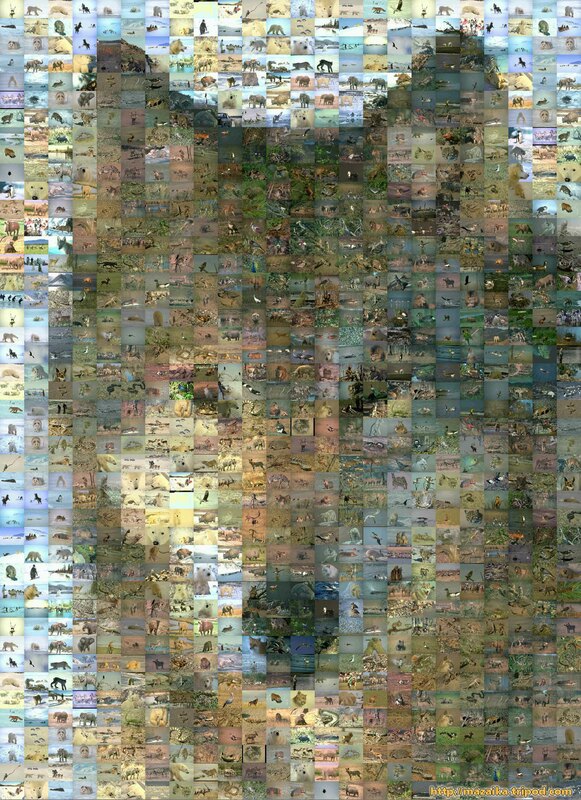 Wolf made from animal pictures. 1100 (25 X 44) cell picture made from a collection of approx 5000 animal photos. The dog from animal pictures. 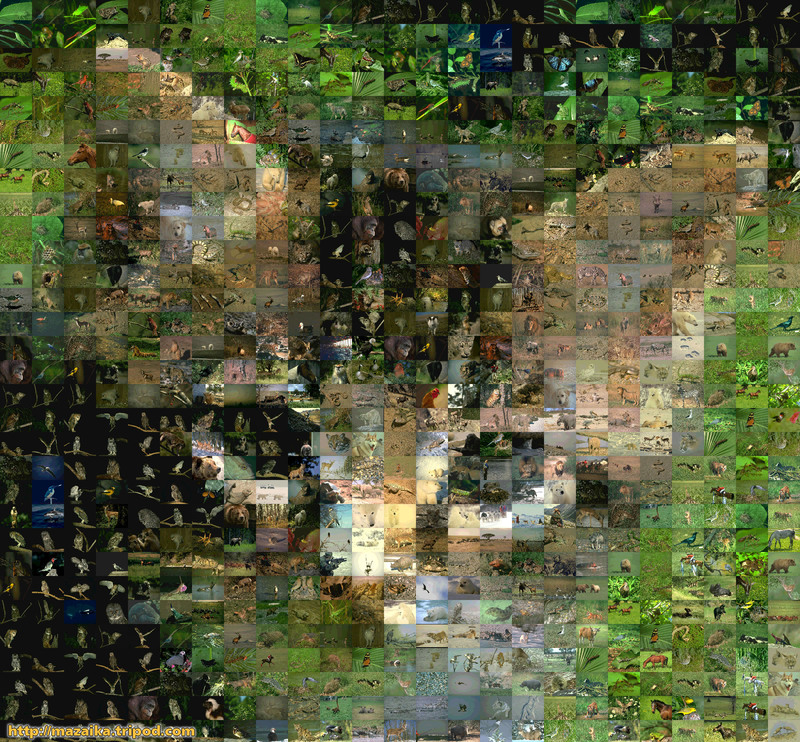 1344 (28 X 48) cell mosaic image was made from the collection of about 5,000 animal photos.